EU Copyright Law facilitates an understanding of the complex legal area of European Union (EU) copyright law and provides for a more conscious application of these rules, especially in relation to the legal framework. Against a background in which technology continues to change the ways we create, use, distribute and consume cultural content – and where there has been a noticeable increase in the body of case law of Court of Justice of the European Union (CJEU) relating to copyright – copyright protection has become an essential component of the knowledge-based economy and the information society. This book, structured around the various rights and issues rather than the legislative instruments, provides a practical, economic approach considering different legal questions that arise in connection with the exploitation of protected subject matter. enforcement of copyright and cross-border issues. 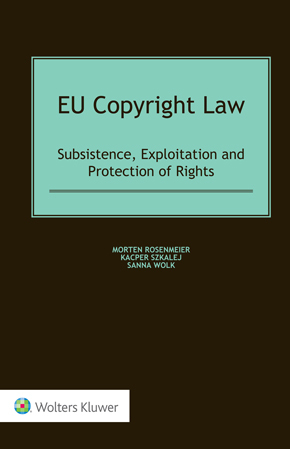 With its practical approach to the various legal rules and principles both at EU level and in the different EU Member States, the book clearly describes in detail how copyright law functions throughout the EU. Professionals, business entities and academics who must be familiar with this dynamic legal area, especially in the digital environment, will benefit greatly from the book’s clear consideration of legal questions that arise in connection with copyright issues. Embracing modern copyright exploitation trends, this book provides a clear understanding of how copyright law functions in the digital environment (in the EU).